Another 2% gap today. For those that feel 2% gaps are becoming the norm – they are. 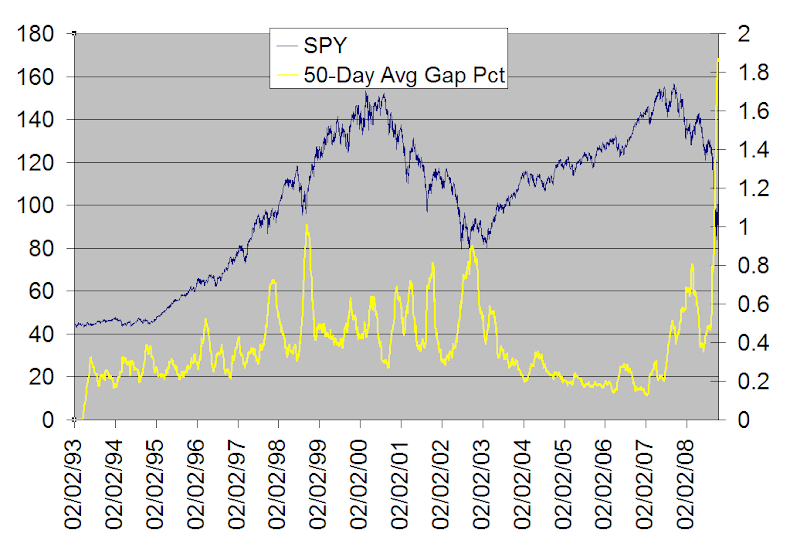 Below is a chart that shows the 50-day absolute average gap of the SPY. Over the last 50 days prior to this morning the average gap had been 1.87% (in either direction). This is nearly twice as large as any other time since the SPY began trading in 1993. First, the chart. Then a few remarks. 1) Notice how prior peaks in the size of the average gap have coincided with bottoms in the market. 2) The fact that we are nearly twice the level of any prior history once again speaks to the unique and extreme nature of the current environment. This can’t be stressed enough. 3) Prior studies I published on gaps that used static assumptions for gap sizes may need to be reworked for the conclusions to be meaningful in the current environment. Interesting data. Can you run it for the S&P 500 going back to at least 1987? Nice research Rob! I believe it's a better research to do a comparison between the 1929 to late 1930s period. These two time periods (since 2007 and after 1929) are more similar than any other recent times.